Quite often, people will purchase aftermarket starter solenoids for their bikes. When they arrive, many are surprised to find that they cannot simply plug them in with the existing plug. Wiring them in is simple, and only requires that you remove the individual plugs from the plastic holder, or clip the wires and crimp on new connectors. 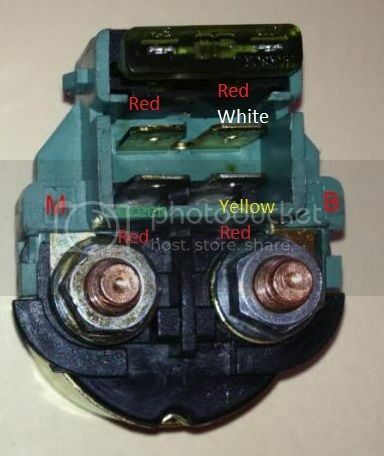 Plug the individual connectors in as follows: "M" identifies the wire to go to the starter motor. "B" is the wire to the battery. Reviving an old thread, this was a life saver for me as I replaced the original solenoid with aftermarket from 4into1. How did you figure out the aftermarket starter solenoid wiring? I wiring diagram was not provided with the unit I purchased, this was the only how-to I found anywhere. Without it, I'd have been dead-in-the-water.